After months of prevarication, the European Union has stated publicly that the free trade agreement (FTA) it signs with India will include provisions for data exclusivity because “it is extremely important for research and innovation’’. 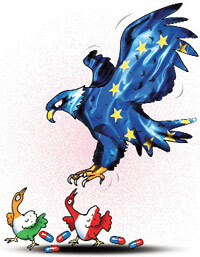 That’s what European Union ambassador Daniele Smadja told journalists in Delhi on January 21. Smadja’s statement confirms what the leaked documents have shown: that EU is seeking higher standards of intellectual property rights (IPRs) than mandated by the World Trade Organisation’s TRIPS agreement. In other words, TRIPS plus. India has so far not given into this demand for several reasons. For one, it is aware that its domestic pharmaceuticals industry would be hit badly by such an agreement, although the EU has been repeatedly assuring Delhi that it would not hinder access to low-cost generic medicines. Not that such an assurance has assuaged the fears of health activists here and abroad. Humanitarian organisations like Medecins Sans Frontieres fear that the restrictive IPR clauses in FTA, which is expected to be concluded by March, would block the availability of low-cost, life-saving medications to patients in developing countries since India is the only major supplier. The general impression is that the big trade blocs like the US and EU arm twist only developing countries into signing such unequal FTAs. This is not quite true. If one looks at what’s happening in Canada, it’s a mirror image of the situation here. With EU about to sign what is termed a landmark FTA with the Canadians, there is a huge ruckus over its implications for the country’s generic drugs industry and on public health. Canada, it must be remembered, has vastly lower prices for medicines than neighbouring US. For years now, American patients have been queuing up at Canadian border pharmacies to top up their medical prescriptions, a practice that Washington, at the behest of its big pharma, has been trying quite hard to stamp out. The first consequence of the patent changes sought by the EU and the Canadian chamber would be steeply higher prices of medicines. One estimate says this could cost patients up to $3 billion more a year. What is more chilling, however, is the uncanny similarity in the lobbying that accompanies such trade negotiations. It usually starts with a report that speaks in glowing terms of the investment benefits of a tighter IPR regime. Such reports invariably claim that enhanced IP protection will result in a huge flow of foreign investment in research and development of new drugs. And inevitably, it is a quisling chamber of commerce or sometimes an arm of the government that will be selling such a line on behalf of the country pushing the FTA. Right now a report prepared for the Canadian Chamber of Commerce is warning that Canada risks losing out on the next wave of pharmaceutical investment and jobs “unless it matches tougher patent protection for drug makers in the US and Europe”. The report says its IP regime is impairing the country’s investment climate. Haven’t we heard this myth time and again in India? In fact, the Canadians would do well to look at an EU study conducted a few years ago that showed investment in R&D has moved from Europe to the US in spite of higher IP protection in Europe. In India’s case, the golden period of foreign investment was during 1970-1995 when it had no product patents. While in Canada the EU is attempting to lengthen the period of patent protection from the current 20 years to offset delays in regulatory approval, in India it is pushing through data exclusivity, which Dilip G Shah, secretary general of the Indian Pharmaceutical Alliance (IPA), points out can be more lethal because it would delay the registration and WHO pre-qualification of life-saving, low-cost generic drugs. The reason health workers and generic manufacturers are worried about data exclusivity is that it cannot be challenged in courts unlike with patents. So all that a European drug major would have to do is submit some data and apply for exclusivity to create a market monopoly for new formulations of known medicines which are actually not eligible for patent. The result: Indian manufacturers would be barred from introducing generic versions until the period of data exclusivity ends—and this could be as long as 10 years. Reflecting the plight of IPA, which has had to defend its interests against the larger corporate lobby here, is the Canadian Generic Pharmaceutical Association (CGPA). Its spokesperson has been quoted in Canadian newspapers as saying that it was unfortunate that the Chamber had chosen to support the patent changes. “They purport to be the voice of Canadian business, yet they are taking only a very narrow view of the brand-name pharmaceutical industry,” charges CGPA. So should the generics industry of Canada make common cause with India’s own to fight predatory trade agreements? Yes, of course. But they would need to fight the sell-out lobbies in their own countries first.